New cedar shingles are more frequently stained than painted, but painted wood shingles are much less maintenance-intensive. Stains will only hold up on cedar shingles for two to three years, while a quality paint will serve as an attractive finish for 10 to 15 years. As with all painting, surface prep is the key to success. The steps required for painting your cedar siding will be roughly the same whether the shingles are newly installed, previously stained or previously painted. 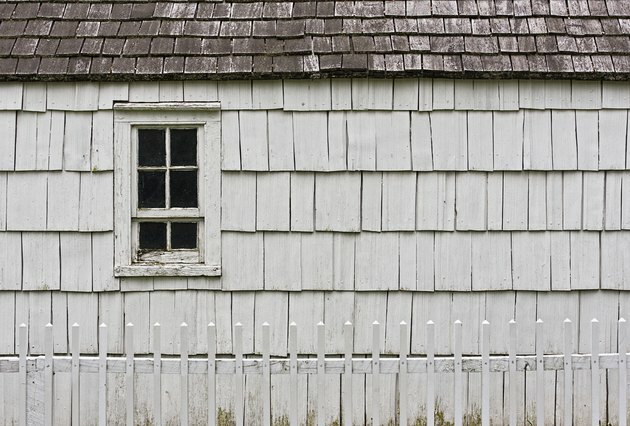 Get professional help if you suspect paint previously applied to the shingles may contain lead. Painted shingles add rich visual texture to a home. Spread canvas drop cloths over any shrubbery, pavement, lawn furniture or decking. Remove shutters. Attach thin plastic drop cloths over windows and doors, fastened by painter's tape. Apply painter's tape over any exterior hardware -- such as flagpoles -- or decorative trim. Use a ladder or scaffold to reach higher areas if necessary. Sand off any extreme protrusions from the shingles using a sanding block -- but do not sand the shingles to perfect smoothness. Any grooving or irregularity serves to demonstrate that the shingles are natural, not vinyl. Climb a ladder, if necessary, to reach higher points on the wall. Wash down the shingles using a pressure washer set at 1,500 pounds per square inch to remove surface dirt. Add detergent to the pressure washer to remove stubborn stains and debris, and wash the shingles again. Finish the wash-down by running plain water through the pressure washer to rinse off any residual detergent from the siding. Hold the nozzle at a 45-degree angle from the wall while cleaning. Allow the siding two days to dry completely. Apply an acrylic latex primer to the shingled siding using an airless sprayer. Allow the primer two hours to dry, or as directed on the product's label. Spray on the first of two coats of an acrylic latex paint, using an airless sprayer. Allow the paint two hours to dry, or as directed on the label. Follow up by applying a second coat.